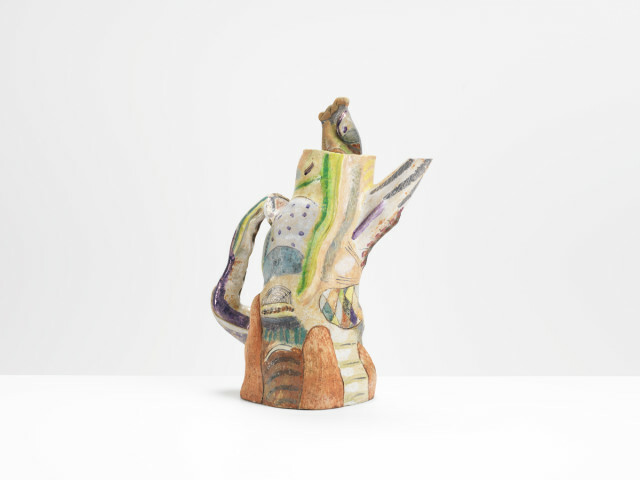 Angus Suttie (1948-1993) was one of the most original and sensitive ceramists of the 1980s, producing surreal and richly ambiguous forms that moved well away from the familiar connotations of much sculptural as well as functional work at that time. Born in Scotland, he was educated in the very experimental atmosphere of Camberwell College of Arts in the late 1970s. His hand-building was inspired by a range of objects from ancient civilisations, often ritualistic in quality, but his complex articulation, his use of colour and deep, often worn looking surfaces, also had a very 20th century urban aspect, sometimes quite baroque in feeling. It had a softness, an organic and amorphic quality, that moved beyond the confines of any set ‘style’. His work, like his critical writing and teaching, was not only highly intelligent and searching, but continually questioning.